Celebrate your marriage with a double row of round brilliant diamonds that create exquisite shine when worn for a wedding ring that is as beautiful as it is understated. The weight of all diamonds combined totals at 0.37ct. 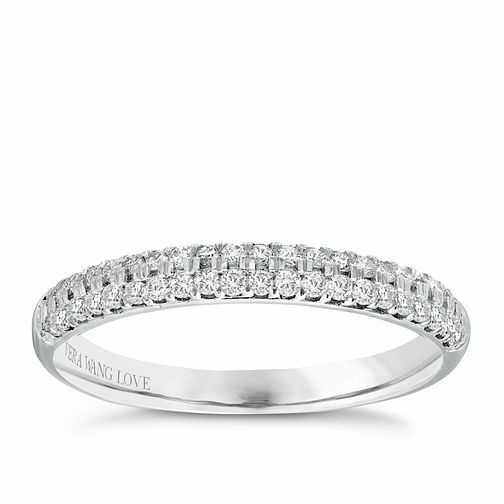 Vera Wang 18ct white gold 0.37CT diamond wedding band is rated 5.0 out of 5 by 2. Rated 5 out of 5 by Anonymous from Love it Really a beautiful ring much better when you see it in person that in the picture,sparkles alot,the stones are deep in so i dont think they would fall out like some of the others.cant wait to wear it.